Sadie (formerly written as ???) is a rock band formed in Osaka, Japan. The band was formed in February 2005 by Mao (? ?, vocals), Tsurugi (?, guitar), Mizuki (? ?, guitar), Aki (? ?, bass) and Sora (?, drums). They began their activities on March 18th 2005 at BIG CAT in Osaka, as the support act for bands such as D, Fatima, Shulla etc. On July 27th they released their debut single "?????????????????-??????? ", as a limited edition of 2000 copies. 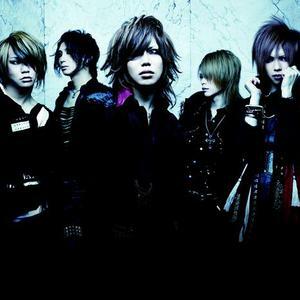 The band was formed in February 2005 by Mao (? ?, vocals), Tsurugi (?, guitar), Mizuki (? ?, guitar), Aki (? ?, bass) and Sora (?, drums). They began their activities on March 18th 2005 at BIG CAT in Osaka, as the support act for bands such as D, Fatima, Shulla etc. On July 27th they released their debut single "?????????????????-??????? ", as a limited edition of 2000 copies. On December 3rd of that year, they had their first oneman live ?dekiai ~ As a sad matter of fact ~ ? in Osaka MUSE HALL in Osaka. Their single "?? -dekiai-" was released only weeks after, as a limited edition of 3333 copies. In January 2006, drummer Sora decided to leave the band due to family reasons. The other members moved on with the band and soon they got a new drummer, Kei (?). Their debut mini-album "The Trend Killer", was released on May 3rd of that year, in only 4444 copies, and was sold out just months after. They released a 2nd press in November 2006, and a 3rd press in February 2007; both were sold out completely just within a couple of months. Their second mini-album "THE SUICIDE MACHINE" saw its release on November 22nd. The album included five new songs and a PV of "??" (Meisai). Sadie was a front-page feature in the December 2006 edition of Cure Magazine. They began 2007 with many concerts and tours, and a fourth single "a holy terrors" released in March; one month later, they released their first LIVE DVD "THE SUICIDAL APPLICANTS", filmed at O-WEST on January 20th of that year. Releases of third mini-album "THE BULLET STORM" and second LIVE DVD "Distract against the terrors" followed. The band opened a fanclub in the summer of 2007, named "UNDEAD". 2008 started with gigs and a new single release, "Crimson Tear" in March; in April a DVD featuring the Crimson Tear song was released. The PV was directed by famous Screaming Mad George. They started a new tour "spring tour'08"Draining the crimson tear" after the single release, and performed with bands like 12012 and ???????. The band decided to release a compilation album "SADIE", since all their previous singles and mini-albums was sold out just months after each release. The album was released on June 25th, and included 15 tracks, all re-recorded. Sadie continued the release party with a new single just one month after, on July 26th when they released "Grieving the dead soul"
They released "Ice Romancer" on December 17th 2008.